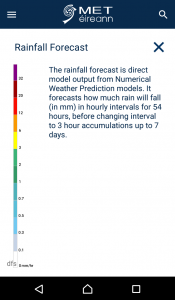 We appreciate this website is a change from how the old site worked so we would like to give users guidance on how to get a weather forecast and find the same or equivalent features from the old website and app, along with a video and images describing how to view them. You may be asked to allow the website to access your location- please allow this, it is only used to generate a localised weather forecast. This information is not stored by us or sent elsewhere. At the top of the page, in blue, is the current weather conditions from the closest weather station to that location. The Weather Map on the top of the homepage (image above) provides the equivalent products to the 3 hour, Short Range (both now obsolete) and 5 Day Forecast on the old website. But now you don’t have to switch from one page to another to view both. 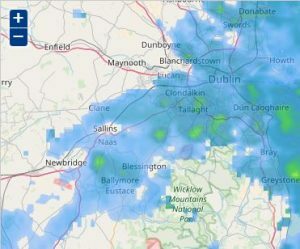 The default map is the Rainfall Radar, it shows the most recent radar image first. Press the Play button to view the last 90 minutes of rainfall images. This radar plays in 5 minute intervals instead of 15 minute intervals on the old website, thus showing more rainfall information. Also, this radar shows where lightning strikes have occurred. The map used across our website is provided by Open Street Maps. For copyright reasons, we cannot alter any names or lines on it. To the right of the map, you can select the other weather forecast maps by clicking on the one you want- Forecast Overview (symbols), Rainfall Forecast (7 days ahead), Wind, Temperature or Pressure. Then click the Play button at the bottom of each map to ‘play’ the weather forecast forward. You can click anywhere on the time bar to view other time images, or you can pull it to the left and right, then click play. The first two days of the forecast move in hourly steps, then the forecast switches to three hourly and finally to six hourly intervals, displaying either an accumulation (rainfall) during that interval, or the weather at the top of that hour. Each weather image is forecasted for that time, more details are provided in the legend description below each map. A feature of the new website is that all the maps (apart from Pressure) can be zoomed in and out- and can be played at other zoom levels. You can do this either by double-clicking on the map or by using the +/- buttons on the top left-hand corner, then use the mouse to drag it to the location you want. This allows you to play the weather images passing over your nearest towns. Please note: the map does not update itself as time passes- you must refresh the page to view the most up to date weather images. Under the map is the detailed, ‘post-processed’ graphical 7-day forecast for a precise location. 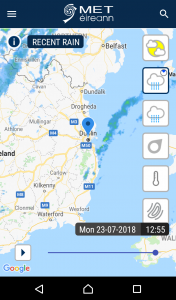 This will update the whole homepage to a detailed weather forecast for that location up to seven days ahead, available by scrolling just past the map. The location will also be shown on the map. 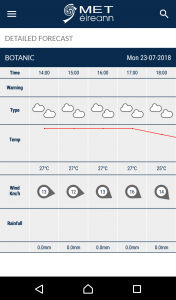 The current local weather conditions at the top of the page and the Regional text forecast will update to this location. The “Recent Locations” box to the right of the map will hold your last 3 searches, and they are clickable for ease of return! Each time the map is clicked, a new detailed forecast is generated under the map with the location displayed. 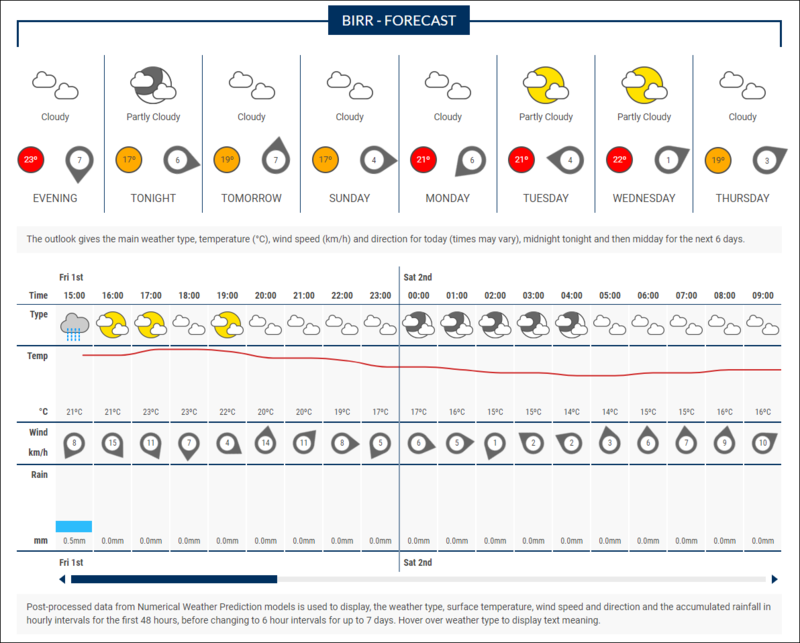 In this way we are providing a weather forecast page that can be personalised to your locations of interest. The daily and evening weather forecast displays the weather at 1200 in Wintertime and 1300 in Summertime in line with IST. 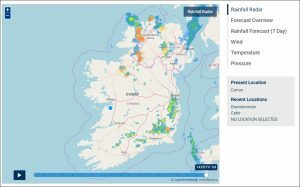 The map and graphical forecast is computer generated but the National and Regional forecasts are produced by Met Éireann’s weather forecasters. 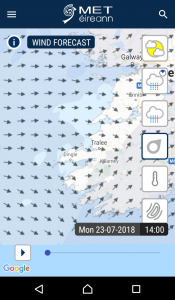 You can find the homepage again from any other page of the website by clicking on the Met Éireann logo on the top left. Website search: The search bar is located at the bottom of each page. You can click on the menu items to view other services available. The Atlantic maps are now available in the Forecast menu here! 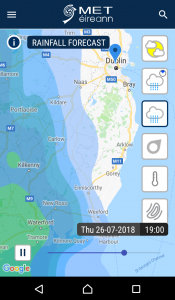 If you have a smartphone or tablet we recommend you use our free Met Éireann app, this is available to download from your Android or iOS app store. There are links at the bottom of this page. The app has a more condensed version of the main website but includes all the same weather map images as the website homepage. Smartphone Users: the homepage weather map is best viewed on the app. When you open the app for the first time, it will ask for permission to access your location. Please allow this. It will let the app access your location from the Google database to provide a tailored weather forecast for there. Your information will not be sent elsewhere. You will also need to turn on your Location Services in your devices’ Settings. If you do not wish to turn this on, you can search for a location using the magnifier at the top right- see the section below for more details. This will give you a forecast for that location if it is on our list. 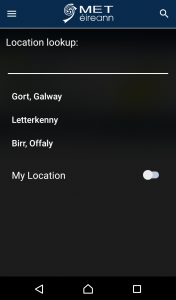 If the app cannot locate you, it will revert to Dublin. 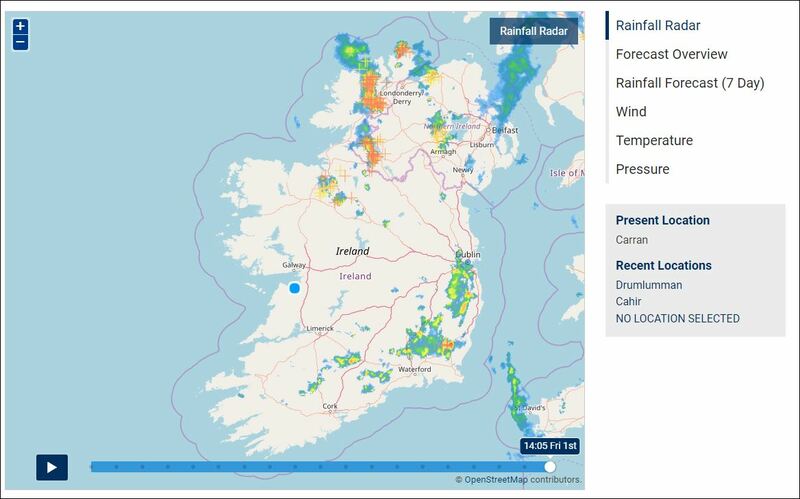 The map shows an overview of your area and the most recent Rainfall Radar image from the last 5 minutes. This sign > is a signal to tap for further information. 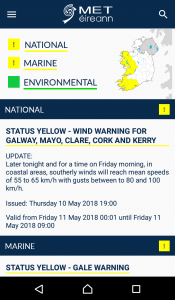 Weather Warnings: View current weather warning map and read details of any National, Marine, Environmental warnings or Advisories. Map: Your location will be centred on the map showing the most recent Rainfall Radar image. Tap this map to see the same weather maps as on the website homepage. To the right of the map are 6 square symbols, tap each to view the radar and other weather forecast maps. The title will change for each map. Play, pinch and zoom in or out (to view the whole country) or move the map around and play it in a zoomed in mode. You can move the slider over and back to view different day/times. Tap the ‘i’ icon for further information about each map. 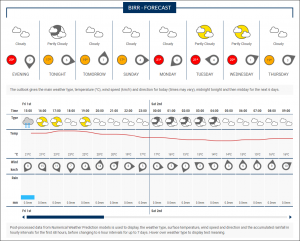 Outlook: The Daily weather section shows the weather at 1200 in Wintertime, 1300 in Summertime in line with IST. Tap each day to show the hourly weather forecast breakdown for 7 days ahead, tailored to your location or another requested location. Tapping the weather symbol brings up the text description at the bottom of the screen. Current Conditions: View current conditions from the nearest full-suite weather station for that location. 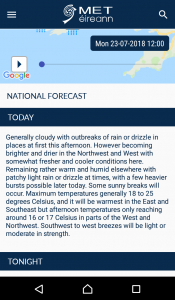 Text Weather Forecast: Read the National and Regional weather forecast and all Marine and Farming forecasts. If you want to read a different Regional Forecast, tap the magnifier and enter a location in that province. This update the app homepage to that area- map, outlook and Regional Forecast. Tap this menu icon for quick access to Home or other sections. Or use the back button to return to Home. To look up the forecast for another location tap the magnifier in the top right. This will update the homepage map, outlook, current conditions and regional weather forecast to the new province. To change back to your location, tap the magnifier and turn on the Use My Location on/off slider. A list of previous searches will stay, you can tap them to get a forecast for that location again- no need to retype. There is also a handy widget available on your device widgets list. This will show the latest readings from your nearest full-suite weather station. Popular pages such as the Atlantic charts, Satellite images and weather station reports can be viewed fully on a device web browser. Current app versions will be on your devices App store. The Irish version is unavailable as the content is currently subject to change due to additional descriptions that may be added pending removal of products on the old site and also based on user feedback, but we can confirm it will be available in time.